Alice Malsenior Walker (born February 9, 1944) is an African American author and feminist whose most famous novel, The Color Purple, won both the Pulitzer Prize and the American Book Award. Walker’s writings include novels, stories, essays and poems. They focus on the struggles of African-Americans, and particularly African-American women, against societies that are racist, sexist, and often violent. Her writings tend to emphasize the strength of black women and the importance of African-American heritage and culture. Walker was born in Eatonton, Georgia, the United States. She attended Spelman College in Atlanta, Georgia and graduated in 1965 from Sarah Lawrence College in Yonkers (Bronxville postal zone), New York. Her first book of poetry was written while she was still a senior at Sarah Lawrence. She returned to the South to work in the U.S. civil rights movement. Walker was also an editor for Ms. Magazine. An article she published in 1975 was largely responsible for the renewal of interest in the work of Zora Neale Hurston. 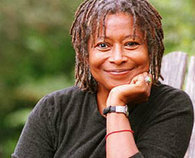 She won the 1986 O. Henry Award for her short story “Kindred Spirits” published in Esquire magazine in August of 1985. A political activist (due in part to the influence of Howard Zinn), she is active in environmental, feminist, civil rights, and animal rights causes. She has advocated ending the decades-long embargo against Cuba. Her daughter, Rebecca Walker, is also a prominent activist. During her youth, an incident left Alice with a permanent injury that would soon scar her for life. While playing with her brothers, she was accidentally shot in the eye, and forced to get a glass replacement because of people’s attitudes toward her. for the same reasons earlier. the poem is so great!, it creates alot of sense and meaning and everything that is said inthe poem is so true. We must live everyday like its a surprise and always learn to appreciate evry little thing that surrounds us. I believe That When She Refers To The “Tiny Human Midget,” Part Walker Is Pointing Out The Imperfections In The World…Discover Why We Have These Imperfections And You’ll See Why We Must “Expect Nothing,” Because They Come Hand In Hand With Disappointment…. Do you have any comments, criticism, paraphrasis or analysis of this poem that you feel would assist other visitors in understanding the meaning or the theme of this poem by Alice Walker better? If accepted, your analysis will be added to this page of American Poems. Together we can build a wealth of information, but it will take some discipline and determination.